This might sound a little strange. But I prefer the smell of fresh herbs to fresh flowers. Have you seen those basil plants they sell at Trader Joe’s? They seriously get me every time. I’ve bought five of them. No, not all at once. And no, my apartment isn’t brimming with beautiful basil plants. Quite the opposite. The problem is my thumb is far from green, in fact, it’s very, very brown. I’ve killed just about every plant I’ve ever had. I know this about myself, and yet every time I see one of the basil plants at TJ’s my mind is transported to a rosy fantasy of having this gorgeous, divinely smelling basil plant sitting on a sunny windowsill in my kitchen. Although, I don’t even have a windowsill… issue #2. So I grab the plant and place it in my cart, justifying the purchase by thinking about how much money I'll save by growing my own basil. What comes next is pretty routine. The plant sits on a shelf in my kitchen and I pick from it when needed, it seems healthy and happy and I’m pretty sure this time is going to be different. But the leafs never grow back and one day the stems are brown, drooping downward, and on the verge of attracting fruit flies. I toss it, mourn my inability to keep anything alive...and then buy another. I’ve done this five times. None have survived. Luckily, I haven’t let this affect my love of fresh herbs. 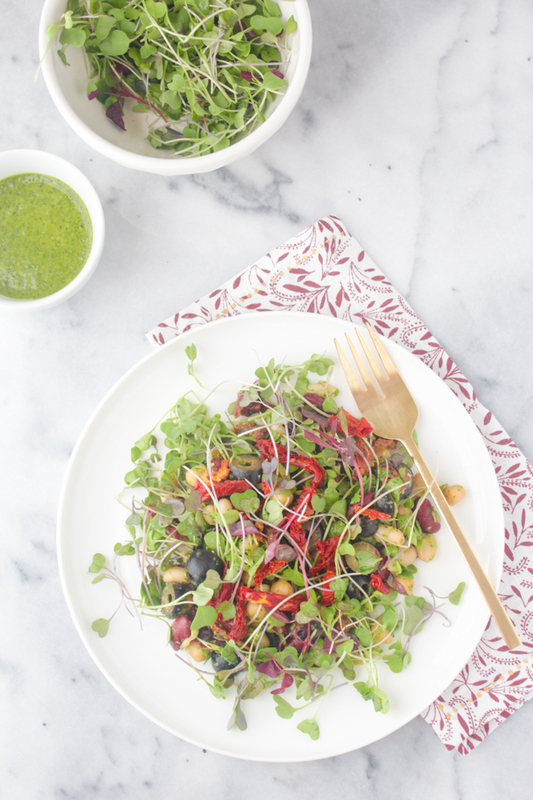 The basil, parsley, cilantro combination in this dressing is incredibly bright and vibrant. 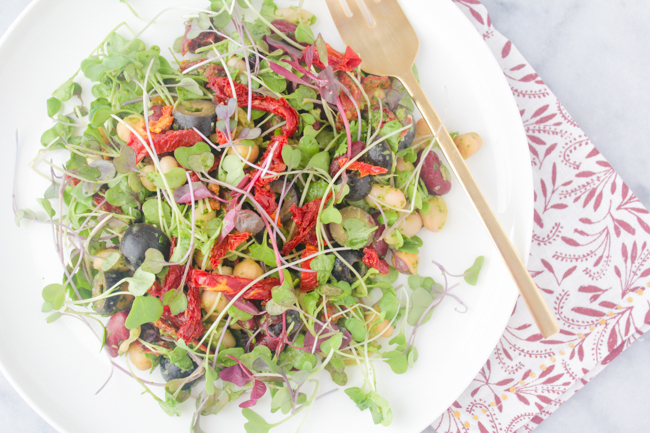 When it's mixed with the sprouts, sun-dried tomatoes, olives, and beans it makes the perfect summer salad that's so good, I might be up for round six. To make the dressing, add all ingredients to a blender or food processor and whiz until smooth. 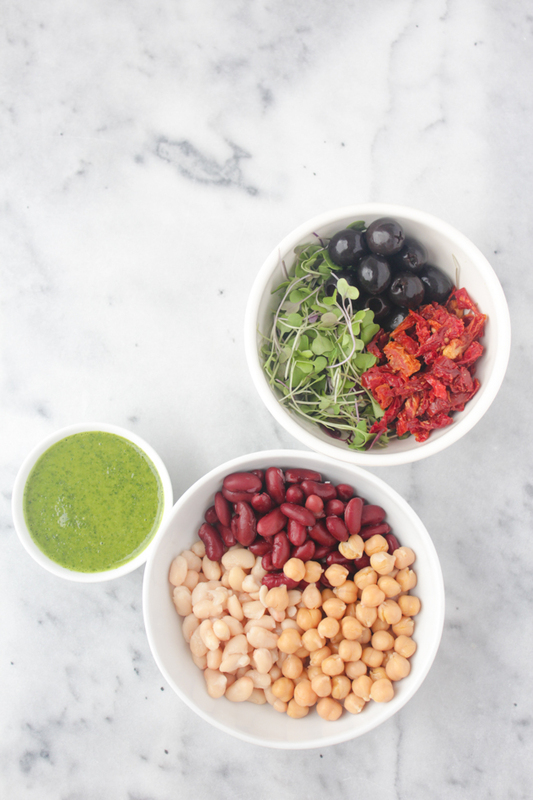 To assemble the salad, add olives, sun-dried tomatoes, sprouts, and beans to a large bowl and mix together. 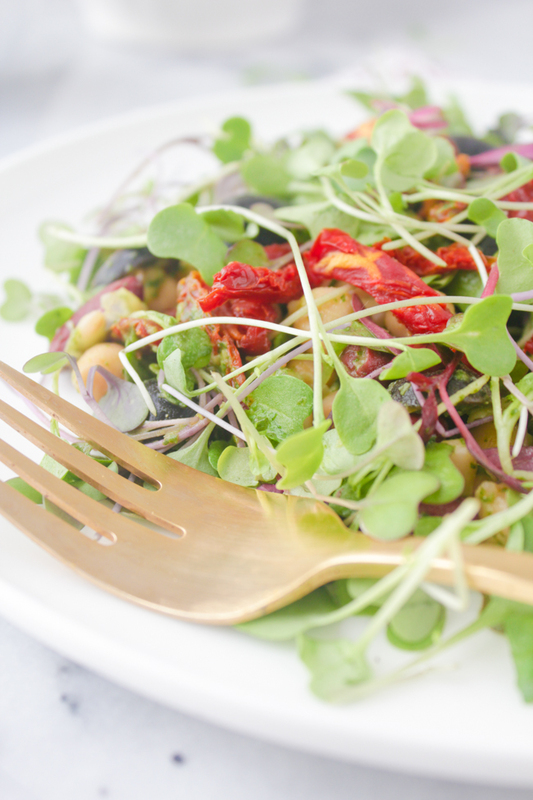 Finish by dressing with herb vinaigrette. Serve immediately. This salad looks delish my dear and the best thing about it is, that it so so healthy too! Great recipe :) Happy Sunday hun! 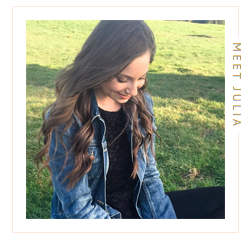 Thanks, love! It is definitely both delicious and healthy - best of both works! This recipe looks delicious!!! I;m loving the golden "silverware"! Thanks, Ileana! They really do smell incredible and make this salad to die for! 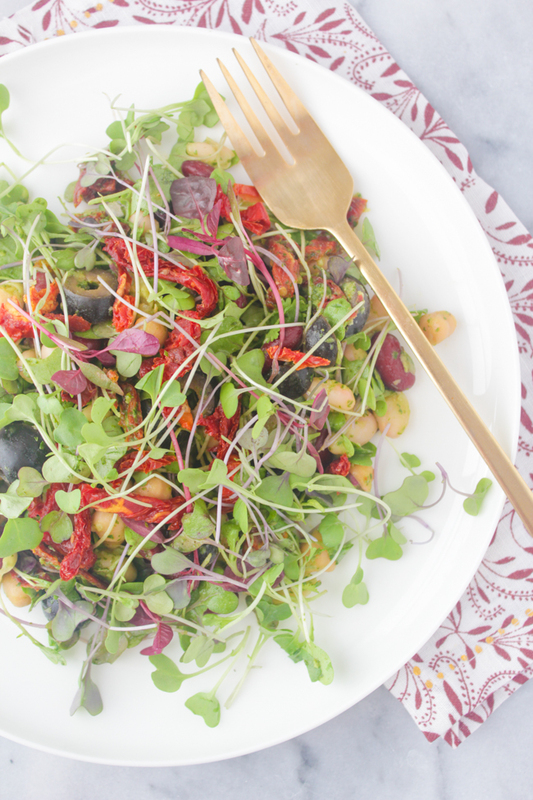 salads are my fave in summer as they're just so refreshing- this one looks great! Thanks, Sophie! Salads are one of my favorite things to eat in the summer too.